Images from Australia’s South Doodlakine Doppler radar are now available on the website of the Australian Government’s Bureau of Meteorology. 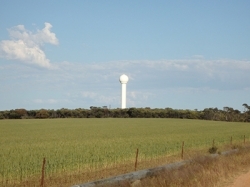 The South Doodlakine radar is the second of three Doppler radars that are part of an A$23m (US$18m) project managed by the Government Department of Agriculture and Food, Western Australia (DAFWA). The images from the radar will allow farmers to access real-time information on rainfall and wind, and are intended to help transform the way they do business. Emergency services operating in the area will also benefit from this real-time information. The first radar, at Newdegate, came online in October 2016, and images from the third Doppler radar, at the Watheroo site near Marchagee, are expected to be available online from April 2017. Each radar will provide a maximum range of 200km, and together they will improve coverage across the Western Australia wheatbelt region. The radars are being built and maintained by the Bureau of Meteorology, and the data will be shared as part of the Bureau’s national radar network. Doppler radars provide some of the best tools for observing real-time rainfall across large areas, enabling farm businesses to make more accurate on-farm decisions.